Rilastil Stretch Marks Gel is a specific, rapidly absorbed treatment especially suited to lessen and avoid stretch marks. Moisturizing, elasticizing and rapidly absorbedWith Essential Amino Acids, Vitamin Complex and Hyaluronic AcidIt can be used in pregnancy and during breast-feeding. Rilastil Stretch Marks Gel is a specific, rapidly absorbed treatment especially suited to lessen and avoid stretch marks. It can be used in pregnancy and during breast-feeding. For all skin types, to avoid and contrast white or red/purple stretch marks. 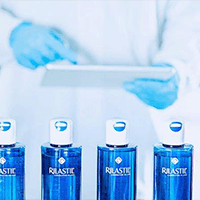 For faster results, it is recommended to use the gel alternatively with Rilastil Stretch Marks Ampoules. INGREDIENTS: Aqua (Water) • PEG-8 • Arginine • Carbomer • PEG-40 Hydrogenated Castor Oil • Panthenol • Sodium Hyaluronate • Hydrolyzed Glycosaminoglycans • Niacinamide • Tocopheryl Acetate • Hydrolyzed Wheat Protein • Leucine • Valine • Isoleucine • Hydrogenated Lecithin • PEG-75 Lanolin • Imidazolidinyl Urea • Allantoin • Sodium PCA • Lysine • PCA • Urea • Sorbitol • Diglycerin • Mannitol • Faex (Yeast) Extract • Lactic Acid • Benzyl Benzoate • Benzyl Cinnamate • Glycine soja (Soybean) Oil • Methylparaben • Benzyl Salicylate • Hydroxycitronellal • Butylphenyl Methylpropional • Propylparaben • Phenoxyethanol • Disodium EDTA • Linalool • BHA • Geraniol • BHT • Parfum (Fragrance).